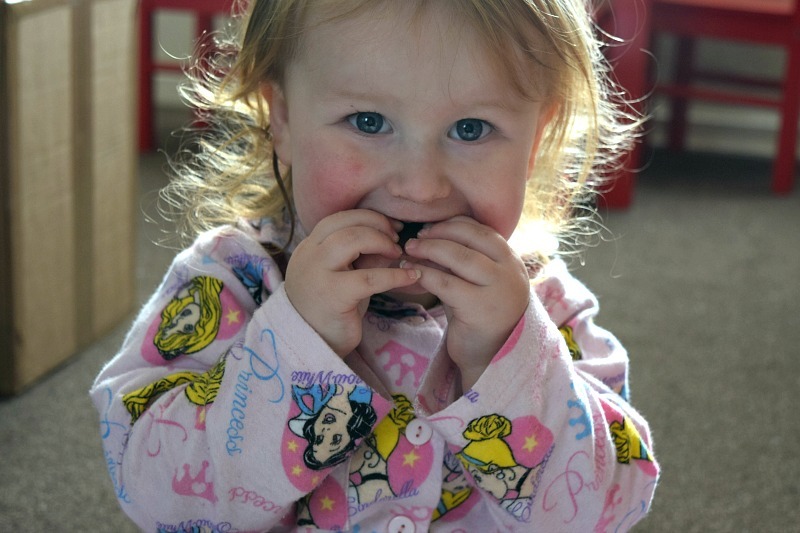 Regular readers will know that my two youngest children have dairy allergies. One of the first things people say when they hear this is 'Oh no, they can't eat chocolate!'. Now what would a world without chocolate be? If it wasn't for chocolate I would probably be a good 2 stone or more lighter, but we only live once so why not indulge in nice foods while we can. Luckily, people with allergies or an intolerance to dairy actually can eat chocolate. Cocoa itself has no dairy content, it is only when milk is added in recipes for specific chocolates that it becomes a dairy item. There are actually a few companies who have whole dairy/milk free chocolate ranges. One of them being Kinnerton, who have just re-launched their Free From range and changed the name to 'Kinnerton Just Chocolate'. The range is actually free from milk, egg, gluten and nuts. I love mint chocolate! Me and Elsie cracked this box open straight away for a try and really enjoyed them. You can see from the photo above that she was quite pleased with her job as chief chocolate tester that day! The Just Dark Mint Chocolate Box is made with the highest quality cocoa and no artificial flavours. 27 deliciously smooth dark chocolate mint discs engraved with the signature ‘Just’ stamp. What I love about this box is that they would also make a great gift for anyone who can only eat Free From chocolate. There are so many choices when it comes to boxes of chocolate for most people but quite often I have found the only option to be buying individual bars to wrap nicely myself. I would definitely buy these and would love to see them make a box of orange flavoured chocolate for people not so keen on mint. I would also love to see bags of mint chocolate buttons, I would buy them for me and the kids! I have bought similar bars like this for the kids many times. They all seem to love orange chocolate. They are a perfect snack size, I tend to break it in half for Zach and Elsie to share as obviously the darker the chocolate, the more rich it is, so it is a bit too much giving them a bar to themselves (although I am quite sure they would eat that much if I let them!). The bar has a lovely orange zest to it and is really tasty. 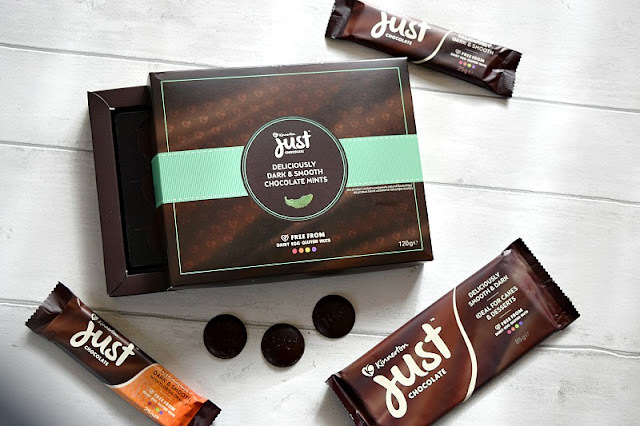 Again, another that I would definitely split up for the kids, the plain chocolate bar is really nice and much better than so many dairy free chocolates I have tried. It is great for on the go and both small snack bars are the same price as other single chocolate bars on the shelf. There is also a share size bar available in the Just Dark Chocolate Bar. Great for adults, whether they want to share or keep it to themselves! I love that they are not overpriced just because they are Free From as so many other brands add a pound or two to the price as they know that there is limited choice. We will definitely be buying from the range in future and would recommend anyone to try them. The range is available to buy from Sainsbury's, Morrisons, Waitrose and Asda.